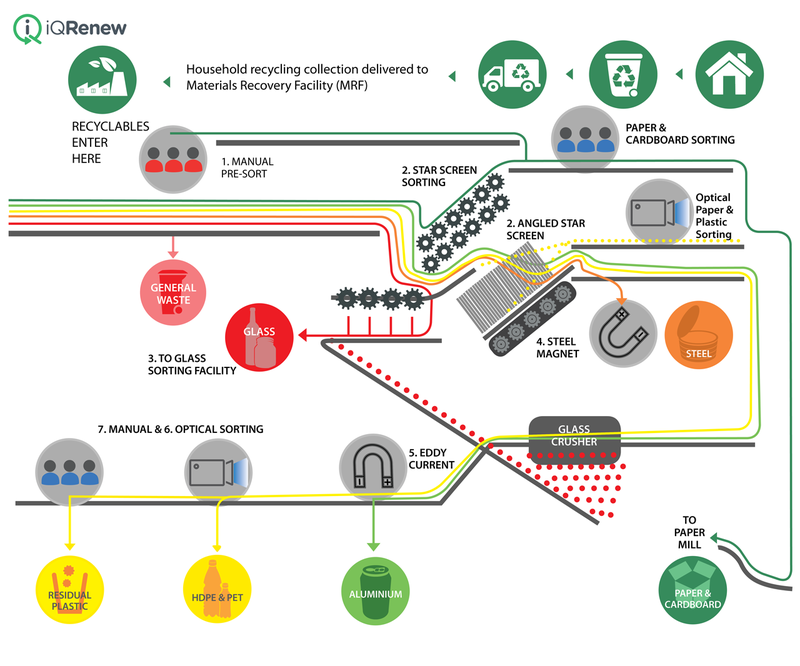 iQRenew and its partners Materials Recycling Facilities (MRF’s) receive co-mingled materials and cardboard. By investing in these MRF’s, iQRenew will enhance their capability to secondary sort and prepare waste streams for markets. What goes on at a MRF? A series of shafts fitted with rotating star shaped discs propel paper and cardboard forward, while bottles, cans and containers fall backward. Sent for further sorting by colour or to glass crusher. Rotating magnets pick up steel cans. An electromagnetic field repels aluminium cans away from other products. Infrared sensors and air jets sort plastic types 1 and 2 (PET and HDPE respectively). MRF staff manually sort the other plastic types (3 to 7).